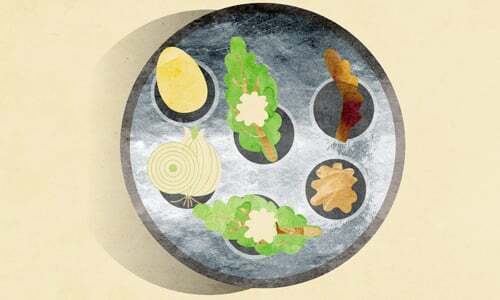 The Seder Plate (Ka'arah) includes most of the ingredients that go into the making of the Seder. Its three matzahs and the six other items are arranged in a formation dictated by their mystical significance and relationship vis-a-vis each other. 1) "Zeroa" - a roasted chicken bone with most of the meat removed. This will represent the Passover offering. It will not be eaten. 2) "Beitzah" - a hard-boiled egg, representing the festival offering. 3) "Maror" - grated horseradish (just the horseradish — not the red stuff that has vinegar and beets added) and/or romaine lettuce, for use as the "bitter herbs" (step #9). 4) "Charoset" - a paste made of apples, pears, nuts and wine. We'll be dipping the bitter herbs in this (steps 9 and 10). 5) "Karpas" - a bit of vegetable, such an onion or potato (used in step #3). 6) "Chazeret" — more bitter herbs, for use in the matzah-maror sandwich (step #10). We'll also need a wine cup or goblet for each participant, and plenty of wine (four cups each). And a dish of salt water (in which to dip the Karpas). Ok, we're ready to start our 15-step Seder. We'll talk more about the function and significance of these items as we proceed. Matzah is unleavened bread. It's made from flour (from one of the "five types of grain" — wheat, barley, oats, rye or spelt) and water only — absolutely nothing else — that are swiftly combined, kneaded and baked before the dough has a chance to ferment and begin to rise. It looks something like a large, round flat cracker. It tastes simply delicious. Matzah may be flat, but it has many faces: it is the "bread of affliction" and the "bread of poverty" which our forefather's ate as slaves in Egypt. It's the "bread of proclamation" over which we tell the story of the Exodus. It's the "bread of humility" that represents our self-abnegating commitment to G‑d, and the "bread of faith" that embodies our simple faith, trust and devotion to Him. It's the "bread of healing" with which we imbibe spiritual wholeness and wellness into our beings. How do I speed up the start of the Seder? Ki Yishalcha Bincha — When Your Child Asks...?